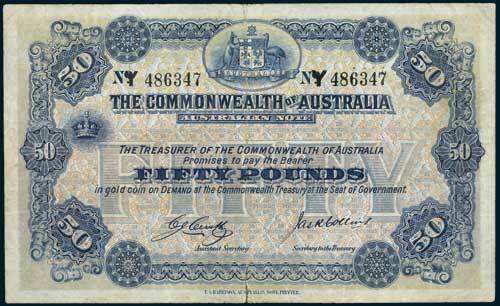 FIFTY POUNDS, Cerutty/Collins (1918) No. Y 486347 (R.67c). Flat, repaired 1cm tear in bottom margin, otherwise fine and rare. Ex Spink Australia Sale 9 (lot 1150), Downies Sale April 1985 (lot 149), Sale July 1997 (lot 1772) and private purchase from John Pettit, November 1998.